An aerial photo of the San Rafael Canal today, looking from east to west. The red arrow shows the approximate location of the 1950 fire, in the area where car dealers are located today. Thankfully, two firefighters escaped from a collapsing roof that spanned two of the buildings. The Independent Journal reported that after they were knocked down by falling roof debris, Dr. Rafael Dufficy, Jr. examined them and pronounced them uninjured. This was only two and a half months prior to the Mar Vista Motors fire on 4th St. in San Rafael, several blocks to the north-west, where two San Rafael firefighters died in the line of duty when the roof collapsed. See our line of duty death section for that story. 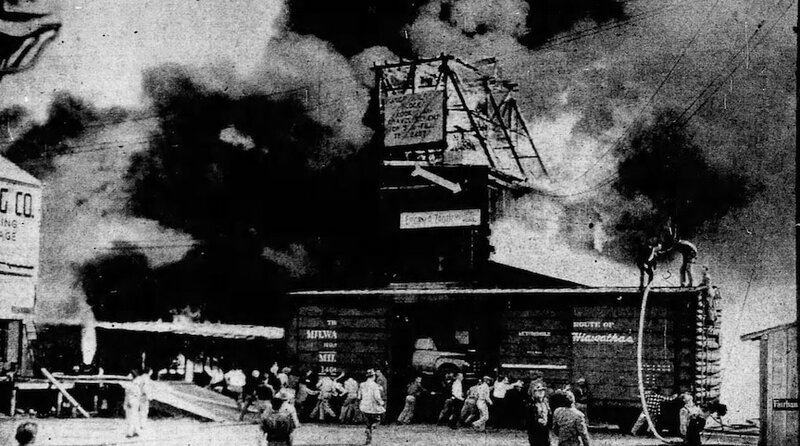 An adjacent building that escaped damage was a large warehouse operated by the same company that contained, among other things, huge rolls of newsprint for the Independent Journal. The fire was first noticed by a departing visitor from the business office of the Storage & Trucking Company. He quickly came back into the office, reporting the fire to Office Manager Mrs. Mel Geister, who called in the fire shortly after 10am. The buildings were part of a complex of structures originally built for, and operated by, the Cheda Company of San Rafael. Guadenzio Cheda was a Marin County pioneer, immigrating from Switzerland in 1850 at the age of 17. He and partner Carlo Solari went on to establish one of the first dairy ranches in Marin County in Tocaloma (Jewell), in the Golden Gate National Recreation area today, where it is still leased as a dairy ranch. Guadenzio would later open a feed and fuel business on 4th St., across from the old Courthouse, and he passed away in 1889. Family descendants would go on to found the Marin County Bank and other businesses. The warehouses had been leased to brothers Mel and Harold Geister. 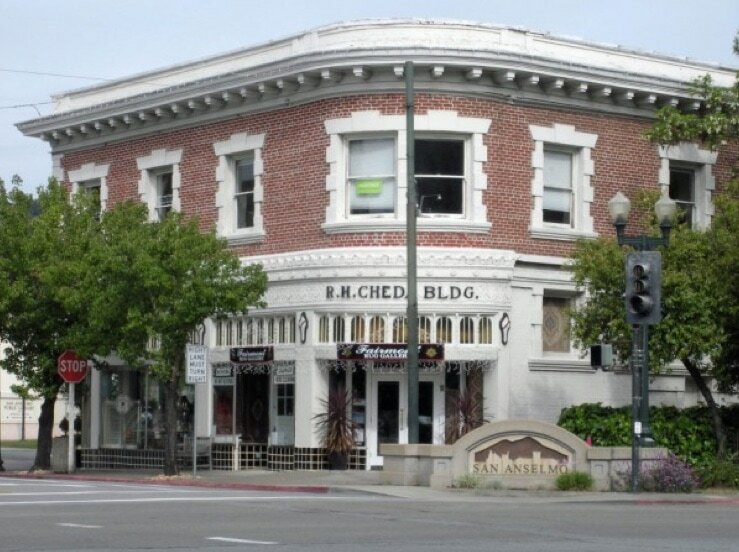 In a classic “It’s a small world…” story, San Rafael Fire Department Inspector Virgilio Cheda had leased the buildings to the Geisters on behalf of the Cheda family owners. Virgilio Cheda was the grandson of Guadenzio Cheda, and we will feature his story soon. Sadly, SRFD Fire Prevention Chief Cheda would die of a heart attack while on duty ten years later. Also in the small world story, the Geister brothers’ father Henry Geister had served for several years as the Corte Madera Fire Chief in the 1930’s, and then as Chief of the Larkspur FD. Mel Geister was a long-time volunteer firefighter in Larkspur, and at one point served as President of the Larkspur Association of Volunteer Firemen that owned and operated the famous Rose Bowl Dance Pavilion until 1963. And for even more "it's a small world", look forward to a future biography on this site of Dr. Rafael Dufficy, Jr., who served as Chairman of the San Rafael Fire Commission and was a very active volunteer fireman with the department. In brief, after graduating from Stanford Medical School, Dr. Dufficy served in the Army during World War II, including landing at Omaha Beach with the 29th Infantry Division on D-Day. ​He later served as a surgeon with the 316th Medical Battalion in France and Germany. He was awarded a Purple Heart and a Bronze Star. After the war, Dr. Dufficy served in the Army Reserves until 1972, when he retired at the rank of brigadier general, commanding the 346th General Hospital at the Presidio of San Francisco. Upon his return from the war, Dr. Dufficy opened a private practice. He served as county medical director from 1951 until 1961, and played a key role in the founding of the Terra Linda Valley Hospital. 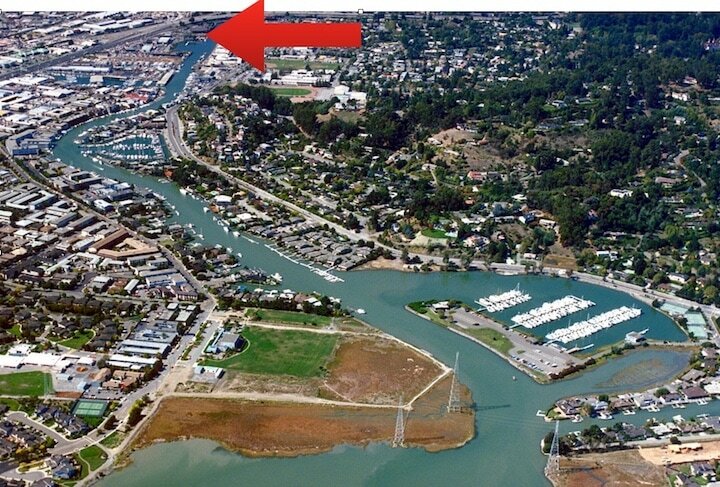 Also, his father Dr. Rafael Dufficy Sr., opened his first medical practice in San Rafael where? In the Cheda Building of course, across from the old courthouse. We could go on, and will do so in the other features. "It's a small world after all..."
Chief Henry Geister, Larkspur FD. The two-alarm firefighting effort took well over two hours, with the Oakland Tribune reporting that 70 firefighters, both paid and volunteer, and ten fire engines from the San Rafael and Marin County Fire Departments responded. While hydrant water was used, one pumper also drafted salt water from the adjacent canal for the firefighting effort. Damage was estimated by the Geister brothers at $150,000 back then, or well over $1.6 million dollars today. It’s likely the full extent of the damage was much higher, since it was not reported if this was just the loss of content, or also included the leased buildings. Buildings Owner and family representative Vigilio Cheda reported they were fully insured to cover the losses. San Rafael Fire Chief Clarence Johansen reported the fire was of unknown origin. Business owner Mel Geister reported that he felt the firemen had “done a good job”, and that they were still open for business and would recover. 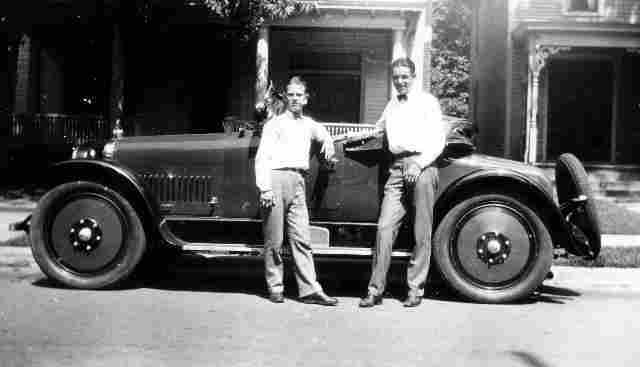 Storage customer Jack Roades lost his museum quality 1921 Nash Roadster, which he occasionally exhibited in car shows. With thanks to sources: Independent Journal March 2, 1950; Oakland Tribune March 3, 1950; Press Democrat March 3, 1950, San Rafael FD, Guadenzio Cheda obituary, Dr. Rafael Dufficy obituary. Roughly 100 bystanders pitched in to push a boxcar away from the large fire. Four new trucks were inside the boxcar, with all escaping damage. Photo from San Rafael FD historical collection, by George Wheeler. More in "It's a small world..." The R.H. Cheda Building in San Anselmo today along Sir Francis Drake Blvd. R.H. Cheda was the son of Guadenzio Cheda. The building sits where the Hotel "Villa Rossi" once stood, until it burned down in major fire in 1910. Look forward to a future story on that fire. A 1922 Nash Roadster. A vintage 1921 model was destroyed in the fire.